Ivory James sired Ivoriona (PT), a two-year-old who posted the second fastest two-year-old schooling race time from 61 starters at Remington Park Tuesday. OKLAHOMA CITY, OK�MARCH 2, 2016�Trainer Stacy Charette-Hill saddled the three winners and the two fastest two-year-olds from 61 head who participated in nine schooling races on Tuesday at Remington Park. Charette-Hill kicked off the training day by winning the first race with the Ivoriona, an APHA daughter of multiple stakes sire IVORY JAMES. The bay filly broke out slightly then dominated her foes with an authoritative 4�-length win under a complete hand ride. 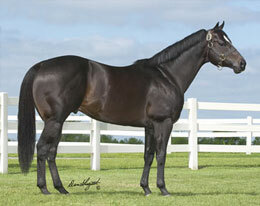 Owned by Randy Hill and Mickey Johnson, Ivoriona is out of the Texas Hero (PT) mare Frona (PT). She stopped the clock in :13.72 seconds into a 24 mph headwind to record the second fastest time on Tuesday. The Remington Park racing year will begin Friday, March 11 and continue thru Saturday, June 4. Post times for the first three race dates will be 6pm on March 11, 5pm on March 12and 1:30pm on March 13.